On Jan. 28, 1986, millions of television screens around the world flashed the same horrific sequence. As the explosion of the Space Shuttle Challenger was repeated over and over, a profound silence followed in classrooms, living rooms and places of worship. America had lost a piece of itself, and the Japanese-American community had lost a hero. The white-plumed trails from the Challenger's pair of booster rockets hung like a dark cloud over an entire nation. 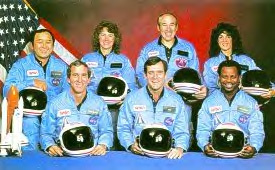 Speaking of the Challenger crew, "their legacy lives on in everything that we do," Astronaut James Reilly said, as he addressed 600 students and teachers attending the 11th Annual Onizuka Space Science Conference at the University of Southern California Saturday afternoon. The theme for Saturday's conference was "Pioneering Science in Space." The program sought to increase high school student interest in space and science-related fields; foster awareness of educational and career opportunities in these fields; and carry on Astronaut Ellison S. Onizuka's favorite activity of helping students by sharing his dreams, striving for excellence, realizing the importance of education, sharing the excitement of the U.S. space program and inspiring them to appreciate the greatness of America. 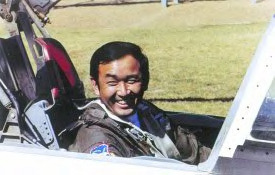 Hosted by the Astronaut Ellison S. Onizuka Committee and USC, and sponsored by Honda Motor Company, Inc., the conference is held every year to honor the dreams and contributions of the late Onizuka. Invitations are sent to high schools from Bakersfield to San Diego, encouraging students and teachers to attend the one-day event. Every year, approximately 600 to 800 students and educators come - like the 14 students from Jefferson Middle School in Torrance, who accompanied their teacher, Kimiko Ego. Ego's 8th grade class was invited because of their outstanding caliber. "We're here because we respect Ellison Onizuka's dreams," the teacher said, "and not to see things as they are, but beyond." "One of the goals of the committee is to continue that legacy that 'El' started," said board member Buddy Takata. "It was created because Ellison was a believer in sharing his knowledge and experience with the younger generation," acknowledged Claude Onizuka, the astronaut's brother. "He wanted people to share any knowledge he had. This community felt that a Space Science Day would be something to memorialize what Ellison had dreams of doing." "Every chance he had, he tried to visit different schools or organizations," Claude Onizuka continued. "It was a constant thing with him to visit any young group or school that was available that would want to have him speak. That's why I think he had such a broad base where he touched a lot of people, 'cuz he was always willing to make presentations." The concept of holding a yearly conference began a year after the Challenger explosion, when friends, family and volunteers organized a memorial service at Nishi Hongwanji Temple in downtown Los Angeles. Astronauts Jim Buchli, Loren Shriver, and Gary Payton attended the service, as well as the entire Onizuka family from Kona, Hawaii. "Right after that, we decided, 'well, let's organize a committee, a group, to, shall we say, perpetuate the name of Ellison Onizuka in memory of him, for the things that he was doing; that is, helping students in terms of their education, inspiring them toward further study, have a dream,' that kind of thing," said Ryo Munekata, secretary of the board. And every year since the first memorial in 1987, the keynote speaker has been an astronaut from the National Aeronautics and Space Administration (NASA). "It isn't everyday that you can get an astronaut, where the students can meet face-to-face with an astronaut and ask questions and talk to him and have that personal contact," remarked Matsuoka. "So I think that's one of the reasons what makes our program so unique." Fortunate that NASA has been so cooperative in helping the committee, Matsuoka remarked that presentations like the one by Astronaut Reilly really sparked the students' interest. "We had to stop the number of students [asking questions] because we had so many that wanted questions answered. And we haven't had that kind of response before," he acknowledged. "It wasn't as large as some of our previous conferences, but I think the enthusiasm of the students, the response that the astronaut got, was greater than has been before." In addition to the presentation by Astronaut Reilly, Steve Shackelford of the Federal Aviation Administration lectured on "Wacky Weather Wonders or Why It's Not Smart to Mess with Mother Nature," while Dr. Charles G. Sammis of USC explained to students how to understand earthquakes. College science majors also held lab demonstrations on a variety of chemistry and astronomy-related subjects. Students were also treated to a free lunch, a tour of the USC campus, and a complimentary ticket to the IMAX theater. "We feel very good about it," admitted Munekata. "I don't know how to say it, but we enjoy putting it on, helping the students. Of course our main interest is in sciences, but, hopefully, a program like this will help them aspire for something and the need for education." And what would Astronaut Onizuka have thought about the conference Saturday? "Oh, he would have loved it," Matsuoka said. "Yeah, I think he would have loved it." - The Astronaut Ellison S. Onizuka Space Center is a not-for-profit educational facility dedicated to reaching out to children and adults to further their understanding of science and space. NASA - features a biography of Ellison S. Onizuka. The Challenger's Center - is an online Challenger learning community.